As a registered dietitian and mom, it is so important to me for my daughter to learn how to eat healthfully. I want her to enjoy trying different foods and want her to make healthy choices. I thought about this topic since I found out that I was pregnant with her and have done everything that I can so far to make her a good eater. Mouth full of romaine lettuce! My daughter is 17 months old and of course, cannot help out too much in the kitchen yet but there are still ways that I involve her. I want her not to fear different kinds of vegetables but instead, want for her to get excited to try different veggies. These are my tips for getting kids involved in the kitchen! I'm sure that they will evolve as Adalyn gets older and we are able to give her more responsibilities. Troy and I cannot wait until she can wash the dishes ; ). 1. Use a Learning Tower- We were sent this Little Partners Learning Tower to review and I cannot say enough good things about it! 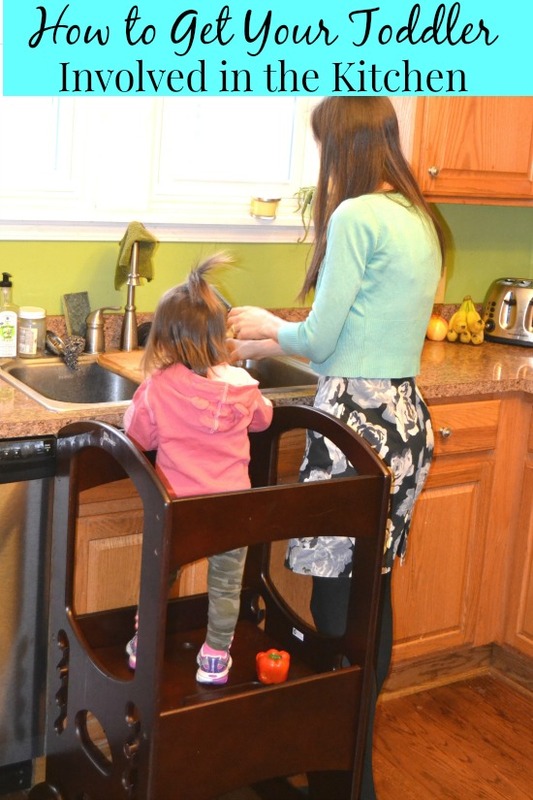 It is a kitchen helper step stool that allows your kids to safely stand right up next to your counter and help in the kitchen. I chose the dark cherry color because I just love dark wood. It is fairly simple to put together as well. I have wanted one of these for forever and Adalyn is now at an appropriate age to use one. I love that she can see what I am doing and is safe. Adalyn loves to stand in this and "work". I give her different things to play with or snack on and she loves it. We have been using this nearly everyday since we got it and know that we will get a ton of use out of it. 2. Give them something to mix- I have been having Adalyn stir up our salad with tongs (with my supervision of course). She loves getting to touch something that she normally would not be able to and I love knowing that she is getting exposed to different vegetables. 3. Let them snack- Although I know that most people would not like snacking right before a meal, if I am chopping something like cucumbers, I let my daughter have a couple because it gives her something to do and she enjoys it. Since it is something light, it doesn't fill her up and since she is generally hungry at that point, I know she will eat the veggies and it helps prevent a temper tantrum. 4. Play with measuring cups- We have cupboards that are completely safe for toddlers and let my daughter play in them. They include her bowls and plates, sippy cups, tupperware, measuring cups and more. This keeps her entertained while I cook and she always has fun. When I am done cooking, the kitchen floor usually looks like a disaster zone but it only takes a couple of minutes to pickup. 5. Wipe down the counters- Adalyn loves to "wash" things so we give her a rag and let her wipe the counter down. Of course we have to do it after her again to make sure that things are really clean. Eventually, she will have her own chores and I think that it is great to start her young learning how to clean. 6. Make the coffee- Adalyn loves to turn on buttons- she turns the Xbox on and off all day- haha! She also loves to turn on our Keurig. We let her turn on the Keurig, take out the old cup, put a new cup in and turn the Keurig on. The only problem is that she loves the smell of coffee and always tries to eat the old Keurig cup! We are going to have a coffee drinker on our hands in the future! Disclosure: This post is sponsored by Little Partners. All opinions are my own.